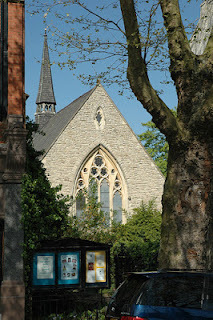 The Unitarian Chapel was built in stages between 1862 and 1885 in a Gothic style, with pointed vaulted ceiling, stone arches, and stain glass windows. Two of the windows were created by the renowned English artists Burne-Jones and William Morris. Plaques on the Chapel walls are dedicated to past members, including the first woman artist admitted to the Royal Academy (Hellen Allingham). The Chapel contains four reliefs by John Flaxman, a noted sculptor from the early 19th century. The atmosphere is one of peace and reverence.